Employment rates for prime-age workers hit new high for recovery. The Bureau of Labor Statistics reported that the economy added 313,000 jobs in February. In addition, there were upward revisions totaling 54,000 to the prior two months’ data, bringing the average for the last three months to 242,000. The unemployment rate remained at 4.1 percent for the fifth consecutive month, but the household survey showed an increase in employment of 785,000, which led to an increase of 0.3 percentage points in the overall employment-to-population ratio (EPOP). The prime age (ages 25–54) EPOP also rose 0.3 percentage points to 79.3 percent, a new high for the recovery. It rose 0.5 percentage points for men and 0.2 percentage points for women. 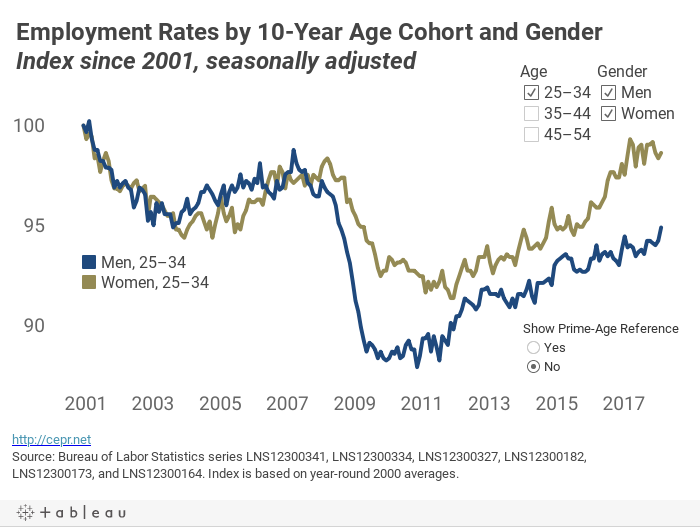 The EPOP for prime-age men now stands 1.2 percentage points above its year-ago level, while the rate for women is 0.7 percentage points above its year-ago level; although both figures are still below their pre-recession level and well below peaks hit in 2000. This is consistent with the view that there are still many workers who are outside the workforce but will return in response to a strong labor market. The strong employment growth was not associated with an uptick in wage growth. Year-over-year wage growth was just 2.6 percent. The January wage figure also was revised down slightly so that reported year-over-year wage growth as of January is now 2.8 percent, a pace seen at several prior points in the recovery. The annual rate of wage growth, comparing the average for the last three months with the prior three months, is a slightly faster 2.9 percent. The job gains in the establishment survey were broadly based. Construction added 61,000 jobs, a number that was likely inflated somewhat by better-than-usual weather in the Northeast and Midwest. Retail added 50,300 jobs in February, pushing employment in the sector 35,000 above its year-ago level. Manufacturing added 31,000 jobs in February, all of it in the durable goods sector, as nondurable manufacturing actually lost 1,000 jobs. Manufacturing employment is up by 224,000 over the last year. Financial services added 28,000 jobs, considerably more than its average pace of 12,000 a month over the last year. Temporary help agencies added 26,500 jobs in February, the fastest pace since they added 36,500 in September of 2016. Health care added 18,500 jobs, somewhat less than its average of 24,100 over the last year. One big loser is the motion picture sector, which lost 9,700 jobs in February, pushing employment in the sector to the lowest level since November of 2015. Average weekly hours edged back up to 34.5 in February. This reversed an anomalous drop in January, which might have been weather related. Most of the data in the household survey was positive. The unemployment rate for black workers fell by 0.8 percentage points, almost entirely reversing the jump reported for January. The EPOP for blacks rose 1.2 percentage points, hitting a new high for the recovery. The duration measures of unemployment fell, with both the average duration and the share of long-term unemployed (27 weeks and over) hitting new lows for the recovery. The percentage of unemployment due to people who voluntarily quit their jobs rose 0.7 percentage points to 11.6 percent. This is still below pre-recession levels, which were above 12.0 percent, and well below 2000 levels, which peaked at more than 15.0 percent. Less-educated workers continue to be the biggest beneficiaries of job growth. The EPOP for workers without a high school degree jumped 1.8 percentage points in February and is now 1.3 percentage points above its year-ago level. By comparison, the EPOP for college grads rose 0.2 percentage points in February and stands 0.2 percentage points above its year-ago level. The overall picture of the labor market in this report is overwhelmingly positive. The economy is adding jobs at a rapid pace, but there is little evidence it is running up against any constraints. The continued increase in prime-age employment rates indicates that more prime-age workers are prepared to enter the labor force if they see jobs are available. And, there is still no evidence of any uptick in wage growth, indicating that employers are not having trouble finding workers.